For two years I struggled with this dilemma. After the bruises from holsters designed for men and attempting to lug my pistol around in my handbag, I decided there had to be a better way for women to carry. 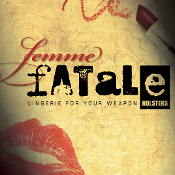 We are celebrating five years of our lingerie-based holster line -- holsters that are both beautiful and easy to wear. Check out our new xXxtreme Corset Holster!